This review is about item#48039643. Quality and price are satisfied, and there is no particular discontent point. I can recommend it. This review is about item#5750114. We are exchanging during machine maintenance. Because it is a manufacturer, things are easy to replace without incompleteness. It is convenient because it is abundant and can be purchased even in small quantities and has a joint link. Iseki crawler management machine got out of control and a power transmission chain was involved and it broke down. Because it broke down in the middle of the field, I repaired myself. Unfortunately the genuine chain was reinforced ... 〇 Truly Tsubakimoto Chain Raising Kanban to Koshien Stadium! Made in Japan I feel the underlying quality. Although I was a bit worried on the standard chain, it works smoothly with a sprocket biting firmly. Because it is cheap 3 meters long, I am safe in the future. ◯ Good rubber crawler replacement and track roller maintenance The crawler type seemed to be easy to fix roller bearings unless maintenance was done, so it was good that we could understand maintenance points as we repaired themselves. Thanks to the company that supplies high quality maintenance parts. This review is about item#48286122. Manufacturers were extremely savored because of parts supply discontinuities. This review is about item#05750114. Although it was used for raising and lowering the unit of about 5 kg, strength can be used without any problem at all. It is appreciated that I can buy it in units of 1M. This review is about item#35274443. 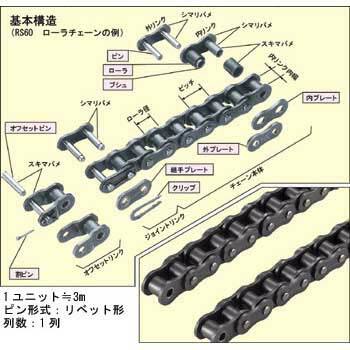 In the machine which had previously used the chain which the manufacturer also does not know, it stretched well and had a hard time, The chain of Tsubakoto is also less stretchy and can be used with confidence. This review is about item#5750132. I think that durability is also sufficient. If you have a solid oil management, you can use it for a long time. I checked the strength and installed as a replacement part. The size was perfect, it moved smoothly and became comfortable. It can be used without any problem as a drive for Nipro rotary. This review is about item#5750193. I could exchange work without any problems. We appreciate your immediate response. Quality is good and can be used with confidence. Just for this size, the chain cutter is expensive. It is smaller than I thought, it is one size larger than the chain of a bicycle. I am grateful that I could purchase it from Monotarou, not a part that can be purchased at a home center but one person can not confirm the part number etc. to a mechanical parts trading company. This review is about item#48263345. I chose Tsubakimoto because it is a relatively loaded part. I am satisfied that the price is also worth the price. This review is about item#05750175. Although I purchased the same size product of Tsubakoto's probably one rank at the same time yet, I feel that it is just a camellia product as expected. In this product, it was 1 meter in length as a big merit, so I was able to take two of my required number. The link pin is rigid, and it is a feeling that it got adequate performance although it was somewhat troublesome to insert because it was not eye-catching with a normal steel file. In addition, in item description, despite the rivet specification, 1 set of connection snap link was attached.